My mother used to scoff, many years ago, when, as a grade-schooler, I would brag about how, someday, me an’ Scotty Haskins were gonna grow up, and then live in a trailer. Something about trailers fascinated me, even then. I think it might be the fact that, in such a small package, one has everything one needs, and mobility, too! Like, my home is my castle, and my castle is attached to the bumper of my car. “Ah, sweet youth,” Mom would tease, “fuggedaboudid”. I watched with great interest any TV shows featuring trailers, as a kid, and that wacky, slow movie, “The Long Long Trailer”, starring Lucille Ball and Desi Arnaz. ( I guess the video ad for that show would have been the trailer trailer). I bought a little red Coleman tent trailer, which slept four, as a young adult, to accomodate my family my wife and two daughters. It was the first thing I ever bought on contract, and paid off, so I guess my good credit, now that I am an old guy, began right there. But I sold it to get the money for, I dunno, braces, something, and spent the most of my adulthood trailerless, that is, until last summer. 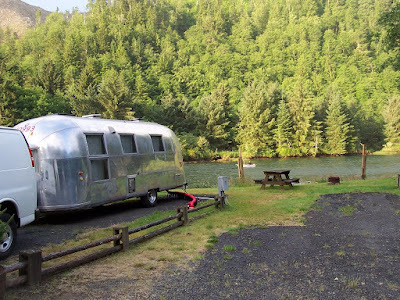 I have no idea what would make a person, who has $3000.00 set aside for emergencies, wake up one morning and decide to buy a vintage Airstream trailer. Not any old silver trailer, (though there are great other vintage silver models, including, most notably, the Spartan), but specifically, an Airstream, those styley retro toasters you have loved forever. 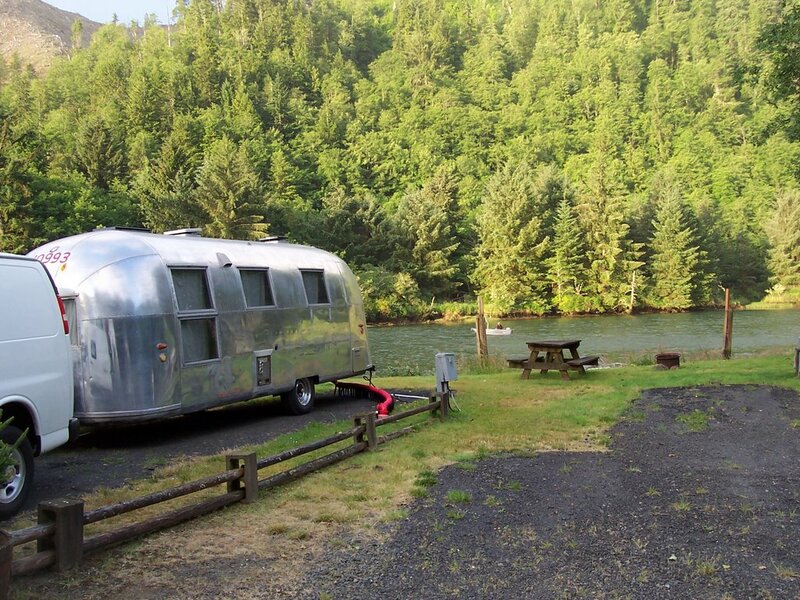 A little silver home on wheels, with everything you need in it, stove, fridge, shower, maybe a cute housewife in a 1950’s lookin’ apron, bangin’ out some homemade, crispy and garlicky fried chicken, or fresh trout. I started cruising the Oregonian, our local newspaper, and watched the “Travel Trailer” section for maybe a month, before a possibility surfaced. It was a friday, in April, 2004, and I was on it. I went about my chores for the day, did some errands, and wound up, about 4pm, in the backyard of an Oregon City couple, whose Airstream had seen better days, as it sat on the “north forty” portion of their property, in very tall grass, lookin’ like a Wyeth painting. It was listed in the paper for $4850.00. Apparently, there had been some confusion between husband and wife, regarding price, because the husband, who was very nice, as we looked the old trailer over, volunteered a sale price of $3000.00, with a bit of guilt in his voice. Perhaps it was the rodent droppings under the oversize and smelly mattress that was lying slumped over the dining table in the fore section of the coach. “I’d let this thing go for $3000.00”, he spoke, “it’s a bit of a mess. And it’s jus’ too much work fer me t’bring’er back. Alls we need is a little Prowler ‘er somethin”. Marie likes to tell the story of my cell phone call to her, driving home, after buying the trailer. She was shocked to hear that I was calling her, at her work, from Oregon City, at almost 5pm. “YOU WHAT?” she replied to my purchase announcement. The trailer, our 1964 Airstream Tradewind Land Yacht, arrived at the parking lot of my commercial building, where I store it and work on it, the following monday. I got to work. My nephew Max helped me with the demo and rebuilding, the spitting and polishing. My wife Marie handled the decor. The refurbishing took all summer. We spent thousands of dollars doing it. It was hard, but it was so much fun. The trailer is our pride and joy, and as a huge bonus, I got to spend time with and get to know one of my terrific nephews much better. And Marie and I took so much pleasure in the final touches, as we placed the newly made cushions and throw pillows, and began to load it up with our own personal touches. At Summer’s end, it so happened that my 2004 CD, “Santa Monica”, was ready for release, at the same time that we felt that we were ready to reveal the progress on the Airstream. So we threw a killer barbecue at our commercial building, flung open the doors of the Airstream, and released the CD all on the same day. We named the party “Refresh, Reveal, Release”, peddled a few CDs, and generally, a great time was had by all. I still have some party favor CD openers, which are pictured here, one of which I would be delighted to send to you, dear reader, for free, if you email me your name and address. There are approximately 13007 songs in the world which espouse the virtues of one’s home town. Songs with lovely, altruistic and melancholy lyrics, songs from deep in the heart of the writer. Songs that aim to take the listener back to his or her own cherished home town. Many of these great songs do just that. Songs like “My Little Town” by Paul Simon. Or one of those “heartland” songs by John Mellencamp. Or one of the hundreds of songs simply titled “My Home Town”, by writers from Bruce Springsteen to Paul Anka to Tom Lehrer. And don’t forget all of those masterpieces of cityism, “New York, New York”, “I Left My Heart In San Francisco”, “ I Love L. A,” and so many others. I love all these songs, and I love my home town. Portland, Oregon. I can identify. But when it came to writing my own song about “my home town”, dang, I couldn’t go there. It’s surely not that I don’t truly love my hometown, with it’s fantastic range of people and places. And it’s not that I don’t have some wonderful childhood memories, scratching my way, bush by bush, straight up the side of Mt. Tabor, or sliding into second on one of the immaculate Little League diamonds at Alpenrose Dairy. Or that I don’t deeply appreciate our wildlife and proximity to the mountains and the ocean. Nope, none of that. I just had this overwhelming feeling, that, well, as far as songs go.....it’s been done. So when a little melody popped into my head a couple of years ago, and it seemed like it might work for that kind of song, I wrote the words.....Santa Monica’s NOT........my home town. And my own brand of “home town” song was born. Santa Monica is, in fact, the title of my 2004 CD. Click here for a clip of the song. LATE BREAKING NEWS! Marie and I are taking a week off, splittin' in the Airstream for parts unknown, get a little R&R, throw a couple overly fatty chateaubriand on the barby, maybe fill up the well. See you in a week or so.